Product prices and availability are accurate as of 2019-04-15 16:40:05 EDT and are subject to change. Any price and availability information displayed on http://www.amazon.com/ at the time of purchase will apply to the purchase of this product. The Omni series was designed for tight detail to broad spraying using a “One Tip-One Needle” combination. The Omni series is a dual action internal mix airbrush. When trying for that one last detail, just the right blend or a great smooth finish Omni detail guns are ideal. Omni airbrushes work equally well at low or high pressures for varying applications. Besides performing well with finely ground colors, Omni airbrushes can handle heavier automotive paint with no need to change tips/needles. Designed with state-of-the-art engineering, Omni air-brushes are manufactured to the tightest possible tolerances. Omni airbrushes feature heavy nickel chrome plating, superior balance, solvent resistant o-rings and numerous other performance enhancements. Omni airbrushes are known worldwide as the performance and price preference to other similarly designed airbrushes. The reversible air cap guard is unique and exclusive to Omni airbrushes– reversing the air cap guard creates a smooth, aerodynamically rounded area at the tip/needle intersection enabling optimum airflow efficiency for the sharpest and finest lines. The “reverse-a-guard” air cap allows for easy removal of tip dry. It can also be utilized to protect the needle tip for novice air brushers or in more delicate airbrush applications. 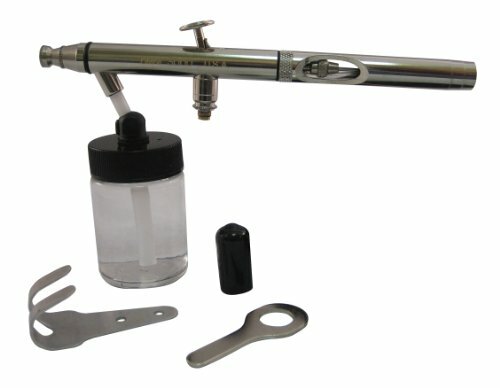 The Model T83 Set contains Omni3000 Siphon feed airbrush with attachable jar, wrench protective cap, and instruction manual. Proudly made in the USA.